Plantar fasciitis is the most common cause of heel pain in the United States with over 2 million patients seeking treatment for this condition in the last year alone according to statistics published by the American Academy of Orthopaedic Surgeons (AAOS). 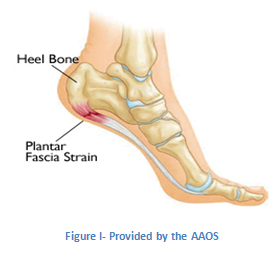 Plantar fasciitis occurs when the plantar fascia, the strong band of tissue that supports the arch of your foot, becomes irritated and inflamed as shown in the image below provided by the AAOS. As a result of the inflammation your heel may hurt, feel hot, swell or turn red. Plantar fasciitis commonly causes stabbing pain that usually occurs early in the morning. If your first few steps out of bed cause severe heel pain, you may have plantar fasciitis. As your foot “warms up”, the pain of plantar fasciitis normally decreases, but it may return after long periods of standing or after getting up from a seated position. If you suffer from plantar fasciitis you are very likely to have difficulty bending your foot so that your toes are brought toward your shin. You also may be experiencing knee pain, a common complaint from runners who suffer from plantar fasciitis. The exact cause of plantar fasciitis is often unknown in most patients, but it is an injury that is commonly described as an “overuse injury” in those who exercise and play sports. The plantar fascia is designed to support the foot as it experiences stress and strain. If there is too much pressure, the fascia gets injured. The human body’s natural response to injury is inflammation, which results in the heel pain and stiffness that you experience in plantar fasciitis. Plantar fasciitis develops gradually with mild pain at the heel bone progressing to more severe pain as the injury gets worse without treatment. Although the pain may not interrupt your workout, you are very likely to feel it afterwards. The most common scenario described by sufferers of plantar fasciitis is severe heel pain that occurs right after getting up in the morning. Pain after a long period of standing or sitting. To make the diagnosis of plantar fasciitis, Dr. Jamshidinia will review your medical history and physically examine your foot. Imaging studies may also be useful to confirm the diagnosis of plantar fasciitis. Imaging Studies: Dr. Jamshidinia may use imaging studies to confirm the diagnosis, as well as get a better visual of the area to see if there are any other problems contributing to your symptoms. If you don’t treat your plantar fasciitis, it can progress and become a chronic condition. You may not be able to keep up your current level of exercise and activity, and you may develop additional symptoms affecting your foot, knee, hip and back because chronic plantar fasciitis can change the way you walk. Treatment options for plantar fasciitis are broken down into 2 categories: non-surgical and surgical. Platelet Rich Plasma Therapy (PRP Treatment) – an increasingly popular and effective treatment option utilizing healing properties isolated from your own blood and injecting them into the plantar fascia to induce rapid healing response over 1-2 weeks. It has been made popular by top athletes, including LA Lakers Star Kobe Bryant, who uses the treatment throughout the season and for major injuries such as his recent achilles tendon rupture. One study showed that plantar fasciitis treated with platelet rich plasma therapy had longstanding healing effects on the plantar fascia compared to a control group that received methylprednisone steroid injection. PRP is done under local anesthetic with sedation if patient desires in a safe controlled environment in our surgical facility thus greatly reducing the minimal chance of infection. Rest – Decreasing or even stopping the activities that make the pain worse is the first step in reducing the pain. Ice – Rolling your foot over a cold water bottle or ice for 20 minutes is effective. Nonsteroidal Anti-inflammatory (NSAIDS) – Drugs such as ibuprofen or naproxen reduce pain and inflammation. Physical therapy – Stretching your calves and plantar fascia is the most effective way to relieve the pain that comes with this condition. Cortisone Steroid Injections – A powerful anti-inflammatory medication can be injected into the plantar fascia to reduce inflammation and pain. Custom orthotics – Custom shoe inserts will provide extra cushioning to reduce tension while standing and walking. Extracorporeal Shockwave Therapy (ESWT) – High-energy shockwave impulses stimulate the healing process in damaged plantar fascia tissue. ESWT is noninvasive procedure with minimal risks, offering an excellent alternative to surgery. Plantar Fascia Release – In this procedure the plantar fascia ligament is partially cut to relieve tension in the tissue. If you have a large bone spur, it will be removed, as well. Gastrocnemius Recession – A rare treatment option where the calf muscle (gastrocnemius) is surgically lengthened to relieve stress on the plantar fascia. The AOFAS recommends that you perform at least three sets of stretches per day. You cannot perform the stretch too often. The most important times to stretch are before taking the first step in the morning and before standing after a period of prolonged sitting.